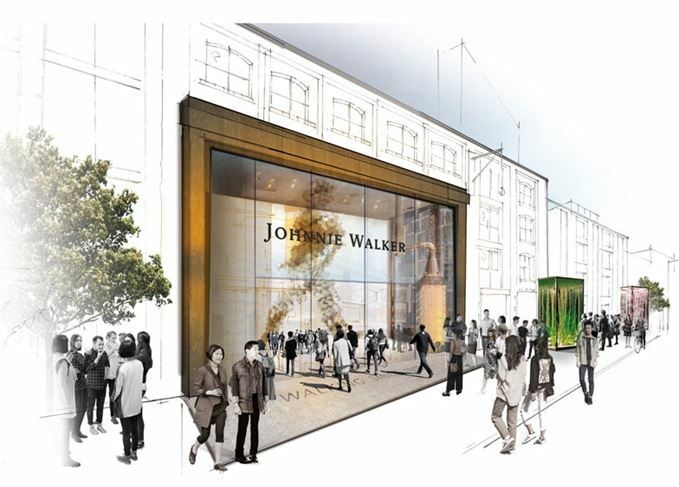 A state-of-the-art Johnnie Walker tourist attraction is set to come to Edinburgh, as owner Diageo revealed plans today to invest £150 million in upgrading its Scotch whisky visitor centres. The world’s largest Scotch whisky producer plans to upgrade its 12 distillery visitor centres and build a brand home for Johnnie Walker in Edinburgh to ‘put Scotland at the cutting edge of the global boom in food and drink tourism’. The new Johnnie Walker attraction at an as-yet undisclosed location in Edinburgh, will feature several floors of whisky, including interactive multi-sensorial rooms, each of which brings to life the characteristics of the four key single malts in the blended Scotch: Cardhu, Caol Ila, Clynelish and Glenkinchie. The attraction will also give visitors an insight into the history of the Johnnie Walker brand, which will celebrate its 200th anniversary in 2020, as well as offer an insight into a day in the life of the whisky’s blenders. Visitors can also learn about the process of whisky making through an interactive experience allowing them to touch, taste and smell every stage from malting to maturation. The experience is rounded off by a trip to the onsite bar, offering drams and tasting experiences. While all 12 of Diageo’s distillery visitor centres will receive an upgrade under the plans, the company intends to build dedicated Johnnie Walker rooms at the four key single malt distilleries whose whisky is used to make up the blend – Cardhu, Caol Ila, Clynelish and Glenkinchie. The Johnnie Walker Retreat at Clynelish will be a relaxed, reflective space designed to immerse visitors in the surrounding landscape; a restaurant serving smoked cuisine is on the way for Islay’s Caol Ila; Cardhu’s new Johnnie Walker room with be filled with artefacts that reflect the distillery’s historic ties with the blend; while Glenkinchie will offer visitors a Johnnie Walker workshop. The investment is in addition to the £35m already committed to reopening the lost distilleries of Brora and Port Ellen by 2020, both of which will also house bespoke visitor centres. The introduction of the new visitor attractions, which are set to open over the next three years, is being called the ‘biggest concerted programme ever seen’ in Scottish whisky tourism. Cristina Diezhandino, Diageo Global Scotch whisky director, said: ‘Scotch is the world’s favourite whisky and Scotland is the greatest distilling nation on earth. New generations of consumers around the world are falling in love with Scotch and they want to experience it in the place where it is made and meet the people who make it. She added that the company hopes the Johnnie Walker experience in Edinburgh would attract the same level of interest as the Guinness Storehouse in Dublin, which currently welcomes 1.71m visitors each year. ‘It is wonderful to have the Guinness Storehouse so near, which offers the opportunity for visitors to learn how Guinness is being created and… really entertains those who come through those doors, really providing an experience for people. Diageo’s 12 Scotch whisky visitor centres attracted 440,000 people in 2017, an increase of 15.2% on the previous year. Welcoming the investment, First Minister of Scotland, Nicola Sturgeon MSP, said Diageo’s investment will help attract more visitors to Scotland, and ‘underlines the fundamental importance of the whisky sector to Scotland’s economy’. ‘Today’s announcement highlights to the world that Scotland is a leading destination for tourists and business investors,’ she said. The world’s largest Scotch whisky producer has witnessed record numbers of visitors. Glenfiddich attracts visitors from around the world, and its senior tour guide has seen it all.